In Fantastic Beasts: The Crimes of Grindelwald, Grindelwald is clearly shown to have one black iris and one pale (white or grey) iris. Is there an explanation of why this is the case? I'm prepared to accept in-universe or out-of-universe answers. (I'm aware of Johnny Depp's personal point-of-view but don't see that as an explanation in and of itself). No in-universe reason is given as of yet for Grindelwald’s eyes. Though it’s possible that there will be an in-universe explanation given for Grindelwald’s different eye colors in information released later on, currently there’s no known in-universe reason. As noted in the question, it’s a choice on the part of Johnny Depp, the actor playing him. When asked about the eyes’ backstory, Depp doesn’t say anything about its in-universe backstory, and only describes it as a symbolic representation of Grindelwald’s internal duality. Past that, no explanation is currently given for why Grindelwald’s eyes are two different colors. There may indeed be one, but if there is, it’s not mentioned anywhere yet. It may be some sort of “replacement” eye like Mad-Eye Moody’s. The one other person seen in the Harry Potter series with mismatched eyes is Mad-Eye Moody, who used to have two matching eyes at one point, but lost one and replaced it with a magical one. Moody didn’t always have the magical eye - he used to have two normal matching eyes. Grindelwald may have also gotten a replacement eye at some point like Mad-Eye Moody did. It less likely may be linked somehow to Grindelwald being a Seer. 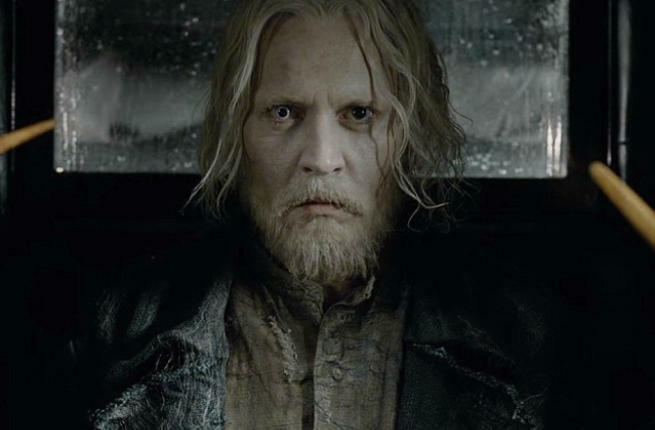 Another possible in-universe reason for Grindelwald having two differently colored eyes is his Seer ability. He seems to be a far more skilled Seer than Trelawney, as he can See intentionally. GRINDELWALD exhales vapor from a glowing skull-shaped hookah. His ACOLYTES watch as the smoke forms a vision of the Obscurus, a swirl of black and flashing red, then resolves into an image of CREDENCE. Though it’s never mentioned that Seers have eyes that are in any way unusual, he seems to be more of a Seer than anyone else seen in the Harry Potter series before, and it is an ability related to ‘sight’, so having it could theoretically affect his eyes in some sort of way. Can a wizard or witch lose his magic?